Happy Saturday, everyone. Battle Rattle is typically pretty quiet on the weekend, but a news release just came through this morning that I didn’t want to leave until Monday. 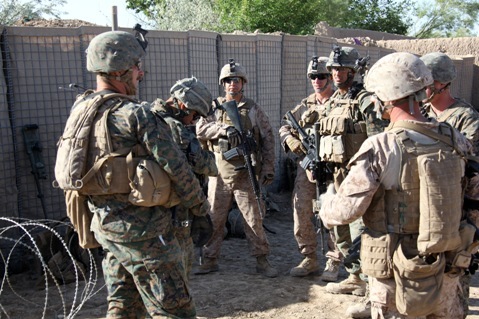 Many readers have been wondering where 3rd Battalion, 4th Marines, out of Twentynine Palms, Calif., would fit into the picture in Afghanistan’s Helmand province. Now we know: They’ll be replacing Battalion Landing Team 3rd Battalion, 8th Marines, according to announcement released by BLT 3/8’s parent command, the 26th Marine Expeditionary Unit, out of Camp Lejeune, N.C.
Marines with 3/4 assumed command of several outposts held by BLT 3/8 in the last two weeks, Marine officials said. They include Combat Outpost Ouellette, which has served as the BLT’s headquarters downrange since they pushed into the upper Gereshk Valley, south of violent Sangin district, after landing in Afghanistan in January. From COP Ouellette and several other patrol bases, BLT 3/8 has provided security for a variety of development projects, including the completion of Highway 611, the second major paved highway in Afghanistan. It hasn’t always been safe, either, as our good friend “Headshot” can attest. Marine officials said BLT 3/8 will meet the rest of the 26th MEU at Lejeune, meaning they won’t be reunited with Marines still deployed with the Kearsarge Amphibious Ready Group until after the 26th MEU returns home. One would assume that will occur soon. A fellow Marine Mom has informed me of your site. We thank you and appreciate any information and response that you can provide us with. Thank you and GOD BLESS! My brother is in 3/4 Lima on his first deployment. This site is now bookmarked at the top of my list. Thank you so much for the updates; you have no idea how much it means to me and my parents. Semper fi, brothers. As the proud Marine Mom of a 3/4 Kilo LCPL I applaud Battle Rattle for its extensive reporting and informaion. THANK YOU FOR ALL YOU DO! My Son is also a LCpl in Kilo Co and I haven’t heard a thing either? does anyone know how to send them mail? Anyone else with Kilo feel free to email me as well if you need the address, need to talk or anything. A good friend of ours is a 3/4 Kilo Company, PFC. May God Bless you and protect you and give you all the courage you need! Love from Colorado, USA! My brother is a 3/4 Lima Co. Thanks for your website, i love it! My fiancé is 3/4 Lima, thank you for updates and please keep them coming! Also if anyone needs the address they should contact 3/4s FRO: Ali Nelson directly. We can’t just give address or information out! My son is in the 3/4 Kilo Company, too. Accurate news is so helpful to us “in the dark.” There’s so little applicable news available in the mainstream. Keep up the good work. Another “thank you” from Colorado! My son is in 3/4 Weapons Unit, and haven’t heard anything since 4/27. From someone that searches routinely for ANY kind of update out there — A BIG THANK YOU!!! Right, we can’t just hand out information which is why i said I would give the FRO number/email. I love this website. Thank you so much. My son is a Lima Marine and he is on his second tour. My son is in Lima also (a DM) we have gotten a few calls (not enough) He is getting lots of “work”. This is our first deployment…and his younger brother leaves for boot in three weeks…..Mom is a little stressed. I’m so glad he has a squad leader with a previous deployment. Thanks for the Information. My son, John, is in 3/4 Kilo. I heard from him last week. His squad was doing okay, though I know he is seeing his first action.